To start an LLC in Mississippi, you must file a Certificate of Formation with the Mississippi Secretary of State. You can file the document online. The Certificate of Formation costs $50 to file. Once filed with the state, this document formally creates your Mississippi LLC. However, to actually ready the LLC to do business, you must complete several additional steps. The State of Mississippi does not accept paper filings. Our free PDF is for informative purposes only. Please submit any Mississippi Business Filings online. Our free account and tools will walk you through starting and maintaining a Mississippi LLC. All for free. To form a Mississippi LLC, you must complete and file the Certificate of Formation with the Mississippi Secretary of State. The document is an example form only—Mississippi requires all filings to be done online. The requirements for online filings are explained below. This is where the Secretary of State will send any official notifications. Like everything in your Certificate of Formation, the email you include here becomes part of the permanent public record for your LLC. Avoid an inbox full of spam and use our email when you hire Northwest. If you want your LLC to start right away, you can skip this section. If you’d prefer to put off your start date (maybe the next tax period is right around the corner), you can put a future effective date up to 90 days in the future. These are numerical codes that correspond to specific business activities. Choose the one that best matches what your business does. It’s okay if it’s not a perfect match. You can enter either an individual or a commercial registered agent. If you choose an individual, you must also include the Mississippi street address where they’ll be available during business hours. Or you can keep it simple with a commercial registered agent like Northwest. A member, manager or organizer can sign and submit your Mississippi LLC Certificate of Formation. Organizers aren’t part of the LLC; they’re people like us who have been authorized to file your form on your behalf. Hire Northwest and we’ll be your organizer. How much does it cost to start a Mississippi LLC? The Mississippi Secretary of State charges a $50 filing fee for the LLC Certificate of Formation. Online processing also has a variable convenience fee that is typically around $4. Hire Northwest and your total out-the-door cost is $279 including state fees, a full year of registered agent service, and cool forms and resources to help you get your Mississippi LLC up and running. How long does it take to start a Mississippi LLC? File your Certificate of Formation online yourself and get your approval right away. The Mississippi Secretary of State doesn’t provide a paper form, so if you want to submit your Certificate of Formation by mail, you still have to complete the whole process online—exactly as if you were submitting it online—and then print it out, mail it in and wait 3-5 days. Really, the only reason to do this would be if you had to pay the filing fee by check or money order. Otherwise, you’re going through the hassle of printing and mailing your Certificate just to wait longer for your approval. If you hire Northwest to start your LLC, we file online and typically have your Mississippi LLC formed within 24 hours. Does a Mississippi LLC need a registered agent? 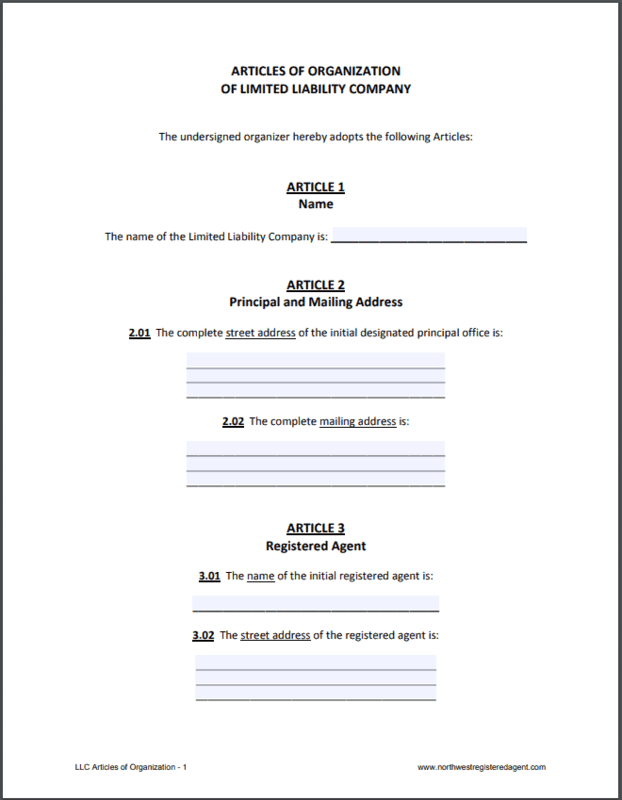 Yes, LLCs in Mississippi are required to have a registered agent. Your agent will have to list the address where they’ll be regularly available, and that address will become a part of the permanent public record for your Mississippi LLC. That means if you decide to be your own agent and list your own personal address, you not only have to be around during business hours every day, you’re also likely to end up with a mailbox full of junk—or even unwanted visitors on your doorstep. And if you switch up your agent or address as your business grows, you’ll be stuck paying the $10 fee to file a Statement of Change each time. Being your own registered agent is a lot of work, and you’re already busy running a business. Instead, consider hiring a commercial registered agent like Northwest. When you hire us, our address goes on your public documents. Our address will remain consistent even as your business grows and changes. We’ll deal with the spam and solicitors, and we’ll be ready and waiting to accept your legal notifications, so you’re not tied to your desk. Consistency, privacy, availability—at Northwest, we give you everything you need to run your business hassle-free. Creating an LLC without writing an operating agreement is like camping in the summer without mosquito repellent—it’s not illegal or impossible, but why in the world would you want to? Your operating agreement is one of the most critical internal documents of your LLC. Your operating agreement puts in writing how your business actually functions—how much each person invested, how profits and losses are allocated, and what happens if you shut the company down. This information is essential for the members and managers in your LLC. It’s also useful for loads of other people you do business with. Lenders, investors, and potential business partners will all want to see your operating agreement. You usually can’t even open a business bank account without one. Not from scratch. We give you a free operating agreement, specific to your management style, when you hire Northwest to form your Mississippi LLC. We give you other free LLC forms too, like resolutions and membership certificates. We were the first website to give out free LLC forms, and while imitators have flooded the web with loads of junk since, we’ve spent years refining our forms. We’re proud of our forms, and for good reason—over a million LLCs have used our free LLC forms to help form and maintain their businesses. You’ll need an EIN in order to register for taxes with the Mississippi Department of Revenue—so if you have to file state taxes (such as sales and use taxes), you’ll need a FEIN. Your bank will almost certainly request an EIN when you open a business bank account. On the federal level, you’re required to have an EIN if you have employees or if you file certain federal excise taxes. Basically, nearly every LLC is going to need an EIN. Even if you aren’t specifically required to have one, EINs can be useful. Instead of handing over your personal social security number, you can use your EIN when establishing credit with a vendor. You can apply for an EIN for free directly from the IRS. Or, you can hire us to apply for one on your behalf when you sign up for services with Northwest. Does a Mississippi LLC need a business license? Mississippi doesn’t require a statewide general business license, but cities and counties may have their own licensing requirements. For example, businesses operating in Jackson are required to get a city business license. What is a Mississippi LLC Annual Report? Your Mississippi LLC Annual Report is a form you file online each year to update your LLC’s ownership and contact information with the Secretary of State. Forget to file? The Secretary of State will revoke your registration or dissolve your LLC after four months. At Northwest, we’ll help you remember—when you sign up for our services, we send you reminder notifications for your annual reports. Want to cross this annoying task off your “to-do” list altogether? Hire Northwest to file your reports for you. How much does an LLC in Mississippi cost each year? There’s no filing fee for a Mississippi LLC Annual Report. Of course, you’ll still have any license or permit renewals and taxes. What are the Mississippi LLC taxes? The state sales tax in Mississippi is 7%, but cities can add up to 1% more, making the maximum total possible sales tax 8%. If your LLC chooses to be taxed as a C or S corporation, note that Mississippi has a corporate franchise tax. The corporate franchise tax is $2.50 per $1,000 of either capital employed or assessed property value in Mississippi (whichever is greater). There’s a minimum corporate franchise tax of $25.